So he was a truly brilliant and original philosopher. 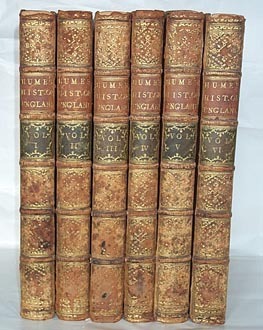 But he was best known during his lifetime for his million-word history of England, The History of England, Volume I (1754-62), in six long volumes. The work covers Britain from the Saxon kings through the Glorious Revolution of 1688. As such, it intersects to some extent with a topic discussed several times before, Steve Pincus’s recent 1688: The First Modern Revolution. So it is worth taking a quick look at a bit of the history, in order to get an idea of howHume thought about historical knowledge and how to present it. The final section of volume I treats the reign of Charles II. (I’m using the Kindle edition; A Short History of England .) This is a key period in Britain’s modern history, following the Civil War, the execution of Charles I, and the brief rule of Cromwell. And, of course, it leads up to the revolution that led to the flight of James II and succession by William and Mary. So how did Hume synthesize this period of history? What factors did he select for inclusion? How did he structure his narrative? And to what extent did he offer large interpretations or explanatory judgments about the period? The book went through some 50 editions during the century following Hume’s death; it was a stunning success with the British reading public. That said, it reads as a pretty pedestrian piece of historical writing today. The prose is inviting and clear; but there is very little to stimulate the reader’s intellect. Content. Hume opens the volume with extensive description of the personality and character of Charles II himself. The focus on the personalities of the period takes a high proportion of the text. Second, he describes the diplomacy and military affairs of the monarch’s court in some detail. (He shows a particular interest in naval battles.) He introduces some of the important turning-points of the period and provides some details about their how’s and why’s. Third, he goes into some detail about the politics of religion and the jockeying of Catholics and Protestants for power and freedom of political and religious activity. Fourth, he gives substantial attention to the politics and actions of Parliament and the King’s relations with Parliament. What is almost wholly lacking is any detail or attention to the social or economic context of the period. There is no mention of common people, villages, agriculture, hunger, or popular religious beliefs. The resolutions of the new King’s finances are discussed, but there is no sustained discussion of the fiscal system or the reforms that were enacted. The “modernizing” efforts of this regime that are so important in the account Pincus offers are invisible in this history. The one exception to this observation comes in the final dozen pages of volume I, following without break his account of the ascension of William and Mary. There he takes a very different approach. He provides a brief summary of the fiscal realities of the Crown, military and naval affairs, England’s state of commerce and manufacture, England’s colonies, the advancement of science and technology, and the state of letters and literature. This chapter is wholly exceptional; it is a synthetic summary rather than a linear narrative, it is topically organized rather than chronological, and it looks much more like a multi-threaded history than the succession of actions, wars, plots, and trials that precedes. Structure. The history takes the form of an entirely linear narrative, down to section breaks for successive years (1660, 1661, 1662, …). Hume structures his task as one of organizing the facts of each year into a story that incorporates the main details of person, event, and political action. There are no synthetic chapters that attempt to rise to a higher level of historical abstraction. The narrative proceeds from court to parliament to war to plots to trials and executions, with virtually no commentary on the sequence. Explanations. Hume’s explanations in this part of the history, at least, are essentially biographical and interpretive. He explains outcomes as the result of the goals and intentions of the elite actors. But he does not offer anything like the large interpretive schemes offered by his contemporary, Edward Gibbon, in his history of the Roman Empire. Hume does not find systemic causes of change during this dynamic period of British history, and he does not attempt to offer a big-picture schema for the period. The character of the king is relevant, as are the motives and loyalties of dozens of other characters. But there is nothing in the way of reference to historical forces or trends. So Hume’s history is NOT a number of things. It is not a precursor to “history from below”; it is not a history of state or social institutions; it is not an interpretive history with a “big-picture” theme of interpretation. And really, it is not particularly interesting from a historiographic point of view. I suppose there is a case to be made for the idea that Hume’s philosophical beliefs themselves were partially responsible for the limitations of his history. Take causal explanation, for example. Given Hume’s skepticism about “real” causes, and given the absence in history of strong regularities, perhaps it is unsurprising that Hume refrained from offering a causal hypothesis about the twists and turns of the period. And given his insistence on the primacy of “facts” that can be observed and documented, perhaps this comes close to implying the necessity of a historical narrative that simply chronicles the facts. If it can’t be observed, then it is pure speculation; and it has no place in empirical historical writing. On this line of thought, it is Hume’s fundamental empiricism that leads to the fundamental flatness of his historical writing. This doesn’t provide a complete explanation — it doesn’t explain Hume’s deliberate exclusion of social questions or ordinary people in history, for example. But maybe it suffices to explain the flatness and linearity of the narrative and the absence of explanatory themes.